This maple wood Shaker Chest is handcrafted by Amish woodworkers and will be sure to become a treasured heirloom item that will be passed on for generations. 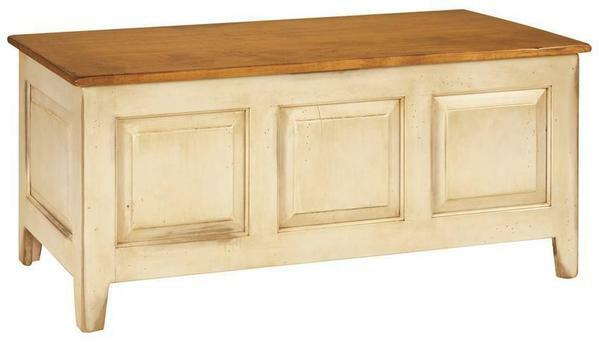 This chest makes an ideal accent table in a living room or reception. This chest is shown in a distressed two tone finish with the top stained in OCS 104 Seely and the bottom painted in a bone white paint with a parchment glaze. Shown in Brown Maple Painted with Pearl White and Finished with a Parchment Glaze. Maple Top, Distressed, with Seely. *Please Note - If the Natural Finish is chosen distressing is not available. We are so very happy with the hope chest and small wood bench that were delivered - what wonderful workmanship. It is rare to see such thorough work with attention to detail these days. Thank you!